Why aren’t we selling value anymore? Definition of Value (n) – the regard that something is held to deserve; the importance or preciousness of something. The material or monetary worth or something. I’m curious as to why during the course of evolution we have associated ‘value’ as being a synonym of the word ‘cheap’. I’d say that a heart transplant is not cheap, but it’s good value. Yet people will opt to buy a cheaper lower quality product if it means they get more of it for the same money and think they are getting ‘value’? Even if it’s nowhere near as reliable or effective as the more ‘costly’ alternative. I believe it’s because manufacturers/lazy marketers themselves have damaged the bridge between ‘cheap’ and ‘value’ and failed to market the ‘worth’ of their products/services. 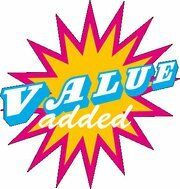 They have re-defined the word ‘value’ and butchered the English language. I think paying for a good lawyer is worth staying out of jail. I think paying for the extra airbags in my car are worth saving my life. Regardless of whether in fact these items are placebos, I have been sold and believe their ‘worth’. Once upon a time we could say these were also good value. Perhaps we need to think of things in terms of selling ‘worth’ now considering that ‘value’ has been well, devalued. What is your stuff worth? What are the hard costs of the consequences? Have you also noticed that when you buy something you talk about it’s good value yet when you try to sell that same thing you talk about its worth? And you always round the numbers. The $1000 item you bought for the special price of $599 becomes ‘about $500’ when telling your friends the price you paid as there’s social respect in getting a good deal. Yet when you sell it on, that same $500/$599 item is magically ‘worth a $1000’ again to your buyer. (There’s also social respect in being a slick salesperson). Insurance companies and doctors sell worth. Retailers sell value. Wholesalers/Outlets sell cheap. And customers have been led to believe they are entitled to all three, often in the same transaction. Why is this broken and who broke it? My new book is about the retail industry and one of the major disconnects right now is how retailers yammer on about how badly they want to please customers — then cheap out on labor, hiring and paying badly, not training staff and wondering why shoppers aren’t thronging their stores. When it comes to retail, for many items, there has been an unrelenting emphasis on (low) price of goods….and the rest of it be damned! Those of us who actually crave smart, helpful and insightful service (the value, for me) remain almost always disappointed. Thanks for the reply Caitlin! I’d love to read your book and learn more about your thoughts and views on this subject as it interests me greatly. I’m currently in the process of building a tech startup in SF here to address this very problem of low perceived equal value exchange created by the retailers themselves by degrading the value based selling process in place of a price only based process. More specifically, the dying art of sales and skilled sales people vs the rise of mindless order takers! Annoys the heck out of me!